Though Peter David's run on The Incredible Hulk is one of the best, that's not to say it didn't have its bad points. One of the arcs had the Hulk, hounded by a vaguely defined and poorly imagined group known as the New World Order, signing on with major X-Villain Apocalypse as his newest Horseman, War. While the Hulk Classics line was terribly short-lived, it did manage to give fans a heaping helping of Hulk variants. Not silly stuff like Spider-Man and Batman always seem to get, but real versions based on the comics. In Series 2, we got this Adam (Andy?) Kubert-designed monstrosity. Hulk is easily one of the strongest, most impervious characters in all of Marvel Comics, so of course it make sense that he'd need armor and weapons in his role as War. Because, you know, he wouldn't be destructive enough without them. Or maybe it was to conceal his identity, since it could have been any 10-foot green monster under there. Yeah. The figure is decent, even if the design isn't. He stands 7 1/4" tall and moves at the neck, shoulders, biceps, elbows, wrists, fingers, thumbs, torso, waist, hips, thighs, knees, ankles and toes. He's got a giant button jutting out of his back as an action feature: push it and he swings his arms. It doesn't impede movement any, but the figure (just like all the others) would have been better without the action feature. The sculpt is excellent, of course. The base figure has a great texture for his skin, and all the armor pieces have lots of little details. The control art for Series 2 was done by Art Adams, but he managed to make War Hulk's face still look like Andy (Adam?) Kubert's designs. 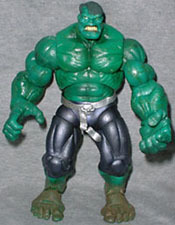 The armor is all removable, leaving you with an almost-plain Hulk: he's still wearing his belt and pants, but that's it. Though the armor is what makes him distinct, it's also his biggest weakness. The actual design of the stuff is just awful: one shoulder pad is short and golden, with giant spikes coming out of it; the other is pointed and black, and connects to the rest of the clothes by a large skull. There's a keypad connected to a red collar, and beneath that is some bronze chain mail. 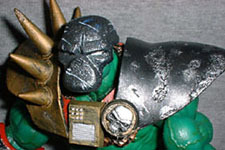 He's got two gauntlets: the right one is a fairly plain piece, black metal lined with a red interior; the left one ends in two short spikes and features a long red tendril attached to the back. What the hell? 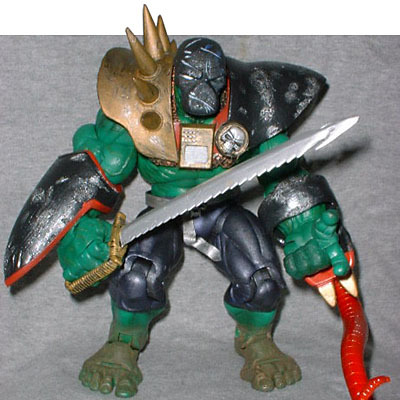 Hulk's also got a big huge sword and a snug-fitting mask, both of which are decent, but man is this thing ugly. It looks like an early Image Comics design. Adam (Andy? ), if you're out there, just one question, man: why? The paint is pretty good. He's a dark green, which could be to suggest the evil influence in his life at the time. His pants are just painted on, not sculpted, but the metallic sheen of the purple paint makes them distinct. The apps on the armor are great, with hints of grey showing through the battle-damaged spots. 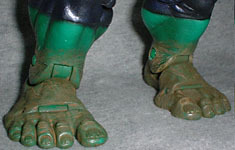 Finally, Hulk's feet are a muddy brown. Sure, it's a nice touch, but why this figure and no others? Who knows. Poor Apocalypse certainly has trouble keeping employees. It seems like he's got a new group of Horsemen every few months. When will he learn that using brainwashed heroes is never going to work? Archangel broke free, Wolverine broke free, and even the semi-savage Hulk broke free. Maybe he needs to work on perfecting his mind control techniques before trying again? Man, that costume: did Kubert lose a bet or something? Tell us on our message board, the Loafing Lounge.